SITE MAINTENANCE - The site will undergo maintenance from 2:00 PM CST to 5:00 PM CST. Please visit us again later. Thank you for choosing Century A/C Supply! month, per topic you subscribe to. Which market area are you nearest to? Which email lists would you like to be subscribed? See our current and upcoming vendor promotions and events. Don’t see what you’re looking for? Call your local branch or sales rep today! When you offer a way to finance a large purchase to homeowners, you are more likely to capture the business and close the deal. You're offering them a way to make affordable monthly payments on a new system that they may not have planned on replacing. Presenting new systems in terms of monthly payments results in higher average invoice amounts and more closed sales. 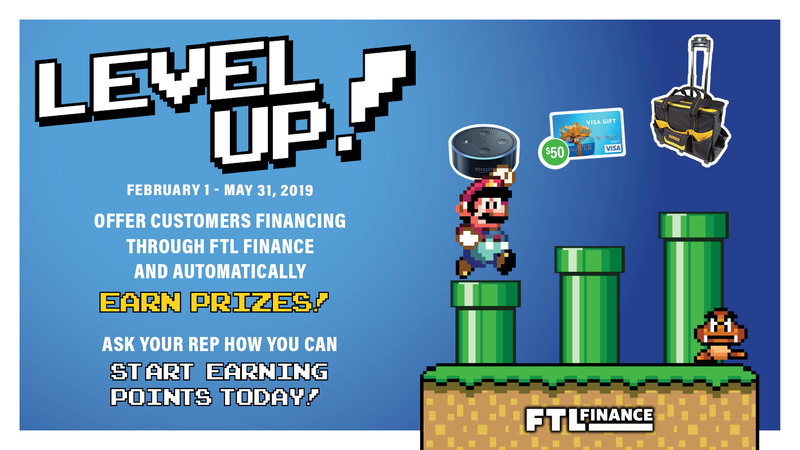 With FTL's Level UP Promotion, going on now, you can earn points for prizes! View the promotional flyer with prizes here. Click to find out more about FTL and register to offer financing. Click on Contractor Registration to sign up and start earning points now! Join Century's Newsletter Network for all the latest news and events.